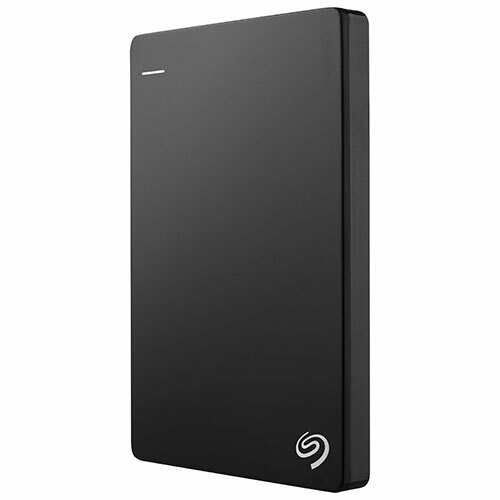 Keep your valuable data backed up and portable with the Seagate Backup Plus 1TB portable hard drive. With a huge 1TB capacity you'll be able to store all of your irreplaceable photos, videos, and documents. The slim, metal design makes it easy to slip the hard drive into your bag and bring it along with you wherever you go. Not only did it demand registration and wanted info about me but whenever I tried to transfer files into it, it just disconnected. It's a piece of crap and I wouldn't come near a seagate product, whatever it might be, even if you paid me. Used for three months - no prob. Went on a small vacation, came back, plugged it in, it started making squeaky sounds and could no longer be recognized. Head crash most likely. I'd avoid - especially if you're using it do back up important data. Go SSD. Worked like a charm 3 months ago, now nothing works, software doesn't start, is "not responding." Tried uninstall, reinstall, compatibility mode, and a bunch of other settings, nothing works. Completely useless for Windows 10. Look online before you purchase, Windows users having all kinds of problems with this drive. Seagate BPlus slim is really only compatible with Mac computers. Seagate did offer a file for download that would allow Windows to recognize the Seagate however it is no longer available. If your running a Mac or using Linux, go ahead and purchase this. Windows users BEWARE, it probably wont work, then good luck getting a refund! I literally just bought this seagate and within MINUTES of me plugging it in and transferring files it randomly disconnected. Then it said Ithat needs to be formatted. It is now a dud. This is the second seagate I've bought that randomly broke. IT ALSO CAME DENTED. SO DID THE FIRST ONE I BOUGHT. CRAP WASTE OF MONEY! I actually bough two of these and was thrilled at how well they worked.... until, I started to have difficulty connecting.... one has now failed totally. On-line issue say that there is a "board" that fails for many people and if you replace this faulty board, they will continue to work. Now looking for two replacements and a tech to remove my several years of information that is "in limbo". I bought this thing because it was supposed to be the holy grail of external drives. I kept this thing in the box and treat it like a newborn baby. I had to upgrade my computer and this stupid drive kept disconnecting. I'm lucky I got everything off of it before it died. ... outside of warranty.. Just what I love doing - throwing away money. When I first got this I transferred about 300 GB of backed up data on this drive. I was adding photos and videos over the course of the next couple of weeks. I didn't move the drive around at all, in fact it stayed in the office. However about a month the drive was periodically failing to read/write anything. On the other hand, I have a 500 GB WD portable that I've used for over 5 years, I've moved it around a lot and even stuffed it into a suite case for travel. That one still works like new. I've been using this for YouTube for a really long time! It's great for storing videos, thumbnails, folders and everything! I'm going to be buying another one really soon! Anyone who has had issues with this product likely had other hardware or operating system problems to begin with. I own 2 of these, have for over 2 years, and I intend on buying a third one shortly. There is no need to install the software that is included - manual backups are ALWAYS the better way to go. As for the cord that is included with this unit it is standard across the industry and anyone that says something different is not a reliable source for tech info. Overall it's a very good product / value. Although buying it somewhere (anywhere) else than Best Buy would certainly be a better option in my learned opinion. I bought this drive because my computer was getting older and I wanted to back-up all my files - I wasn't going to be one of those grad students that loses their thesis because of computer trouble. Joke's on me. I bought this drive and installed the weird program that comes with it. I transferred my files onto it, or so I thought, but then the next day when I went to work I couldn't find any of my files on either my computer or the brand-new external hard drive. I called Seagate and they were of absolutely no help. They told me they couldn't give me a refund, and they tried to make me buy another product to recover the data that their product had lost. I had to take my computer to a data recovery service, which cost me hundreds of dollars. Do not buy this drive. It does the exact opposite of what it is supposed to do. Do not end up like me with thousands of hours of work gone and no choice but to pay big money to get it back. Plus I spent [price] on a product I can't return and can't use. speed, price, capacity & physical size ALL to my satisfaction. One downside is: it dose NOT use the industry standard USB port cable, the end that connects to the back of the USB hard drive looks like a proprietary Seagate cable, so if you lose that cable you could be in big trouble! I had never backed up my files with anything more than (floppies in the past) flashdrives but I really wasn't doing a very good job of it. I bought the external hard drive in May 2015 and copied all of my files onto it shortly thereafter. Needless to say, I needed something that was easy to use as I had never used such a device before. One thing that I did differently was to copy the files (maintaining folder structure so easy to locate files) rather than creating a back-up. This drive was ready to go right out of the box. In October I ended up having to wipe my harddrive. While some files were saved, it seemed that not all were (the laptop had to go in for repairs a few times). While I was ready to lose the data, boy was I happy that I had copied everything onto the external drive !!! The only thing that I have learned (the hard way) is that I should do the back-up more often as I did lose the files saved between May and October. This 1 TB unit is a good way to backup and move your files from device to device. However, despite the on box advertisement, my unit did not have the EXE file to install the Seagate software (called Dashboard) on my Windows PC. It did have the mac file. I was able to go to Seagate's web site and download the file directly from them, but it was a clumsy procedure. Note: You can manually move files to the Seagate without the Dashboard but Dashboard offers more options. All seems OK now but that was a disappointing way to begin my experience. I've had it now for 2 months, was easy to install and it's so compact it takes up no space on my cluttered desk. The price was excellent but the peace of mind is even better. Just plugged it in and it works great no troubles, will see in a year though, but right now, super. And it is 1/10 the size of my old 200 g HD that also required its own power source. Don't buy this external hard drive. A few weeks after I purchased mine, it stopped working. I couldn't be detected by three different computers with three different Windows OS, including Windows 7 and 8. I searched for a solution online but to no avail. Seagate offers a "warranty" of sorts: you have to pay to ship it back to them and they may just replace the defective drive with a refurbished one. It's just not worth the time and aggravation of losing all your data after just a couple of uses. Best investment i ever made works great..